Version of has_child that sets a pointer to the child if the child exists;. returns true when the plugin is allowed to run the show. General class for user to obtain ClusterSequence with additional area information. 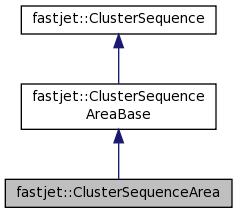 Based on the area_def, it automatically dispatches the work to the appropriate actual ClusterSequenceAreaBase-derived-class to do the real work. Definition at line 51 of file ClusterSequenceArea.hh. Definition at line 112 of file ClusterSequenceArea.hh. return something similar to the number of pure ghost jets in the given rap-phi range in an active area case. For the local implementation we return empty_area/(0.55 pi R^2), based on measured properties of ghost jets with kt and cam. Note that the number returned is a double. Definition at line 124 of file ClusterSequenceArea.hh. overload version of what's in the ClusterSequenceAreaBase class, which additionally checks compatibility between "selector" and region in which ghosts are thrown. Definition at line 146 of file ClusterSequenceArea.hh. overload version of what's in the ClusterSequenceAreaBase class, which actually just does the same thing as the base version (but since we've overridden the 5-argument version above, we have to override the 4-argument version too. Definition at line 162 of file ClusterSequenceArea.hh. overload version of what's in the ClusterSequenceAreaBase class, which actually just does the same thing as the base version (but since we've overridden the multi-argument version above, we have to override the 5-argument version too. Definition at line 173 of file ClusterSequenceArea.hh. overload version of what's in the ClusterSequenceAreaBase class, which additionally checks compatibility between "range" and region in which ghosts are thrown. Definition at line 185 of file ClusterSequenceArea.hh.